Actual Updater 4.0 has been released! Actual Installer 7.2 has been released! Actual Installer 7.0 and Actual Updater 3.3 have been released! Actual Installer 6.9 has been released! Actual Updater 3.2 has been released! Actual Installer 6.8 has been released! Actual Installer 6.6 has been released! Actual Installer 6.5 has been released! Actual Updater 3.0 has been released! Actual Installer 6.4 has been released! 1Click Uninstaller 2.0 has been released! 1Click Uninstaller is freeware designed to facilitate the uninstall process. The program eliminates the need for a standard time-taking way to uninstall software. This smart solution for those who want to save their time allows removing programs with just one click of a mouse. And what is more, 1Click Uninstaller provides a user with a list of recently installed software, making the uninstall process even easier! Plus it allows killing any hanging processes. Actual Installer is a professional tool for creating great-looking installation packages with incredible ease. The wizard-driven interface allows you to forget about tedious and time-consuming scripting - the program will take good care of this. 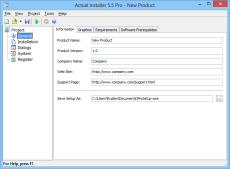 With Actual Installer you can create an installer for you product in minutes! Actual Installer features advanced capabilities, such as multilingual installations, registry and INI files modification, file associations, registering fonts, ActiveX components and much more! 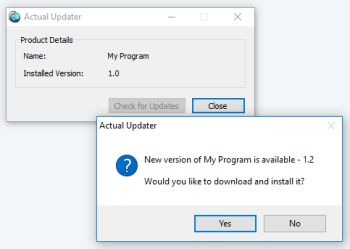 Actual Updater is a free & simple tool that allows software developers to add the Update feature into their Windows products. Use this tool to provide the latest versions of your products to your customers. Adding the Check for Updates feature into any software, no matter what installer you use, takes just a few minutes. Our mission is to help businesses from start-up to large corporation who want to host their website. https://certahosting.co.uk/hosting/drupal-hosting/ provide businesses with flexible options for web and email hosting that will grow with them.